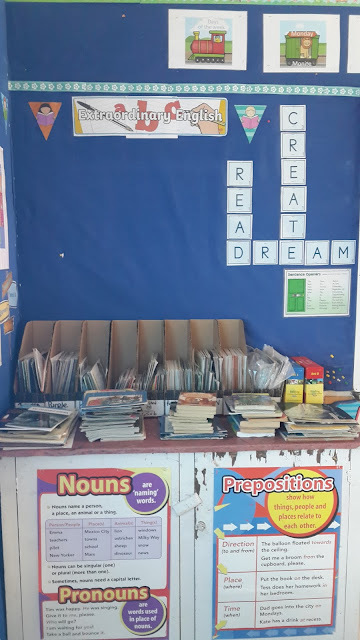 Mrs. Elu was away for professional development in Fiji and I had the wonderful opportunity of teaching her grade 5 and 6 class for the last 3 weeks of the term. During my final week of relief teaching at Papaaroa School, I wanted to do Mrs. Elu a favor - cleaning and decorating her classroom for the new year. Twinkl, a website I absolutely love was my main source for decorative purposes. I wanted to share what I did and hopefully give other primary teachers some ideas for their classrooms. First, a class redesign was in order. I had a vision of a 'reading corner'. When I was teaching, I was instructed to keep up with the regular SSR - 'Sustained, Silent Reading' that should happen at least once a day. I noticed quickly that the students would grab a book from one side of the class and bring it to the front to sit down on the carpets. I thought that I should rearrange the classroom so that the books were in the same area as the carpets. 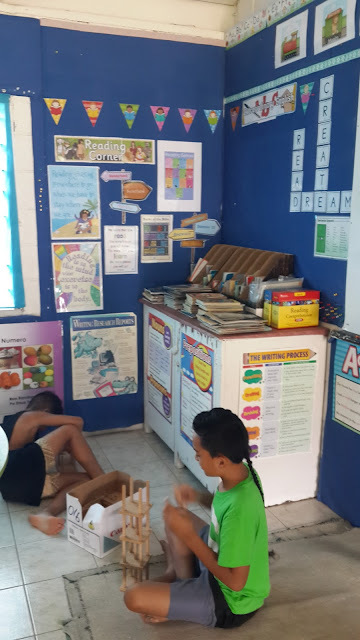 Hopefully, they could buy some large pillows or beanbags in the future to really make the reading corner a cozy place. I got all sorts of print outs for the reading corner. 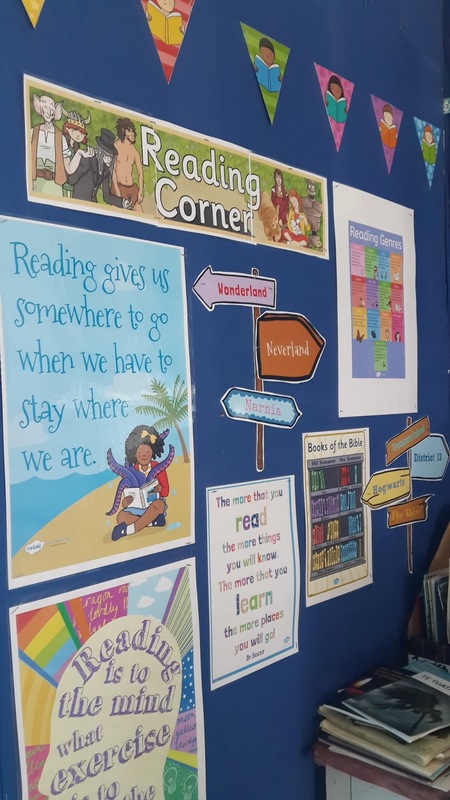 I loved the reading corner display pack, which features many posters with famous quotes about reading. The reading quotes, banner and street signs are from Twinkl - I printed and laminated them. I love the Scrabble tile idea! I left space for the teacher to post up some English work, next year. 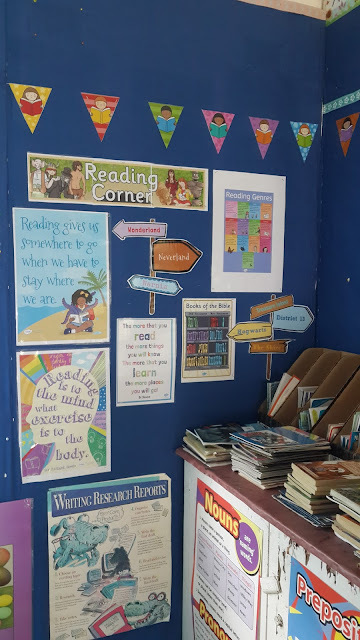 This is the English corner as well as Reading corner. I absolutely love the triangle 'bunting' - there are all sorts of varieties of bunting on the Twinkl site. I printed these 2 for each A4 page, but you could print them smaller or larger. You can also see the cool 'Books of the Bible' - perfect, as it's a Christian school. 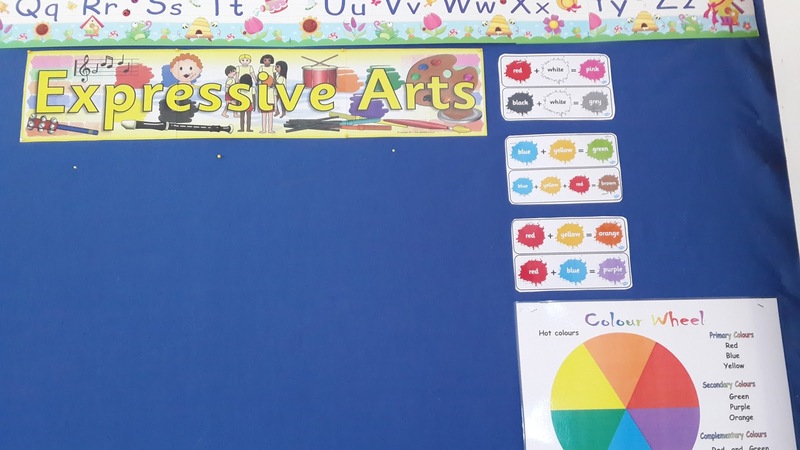 Every area of the class falls into a subject section - this is the Art area... I posted up a few Twinkl posters of colour mixing here. 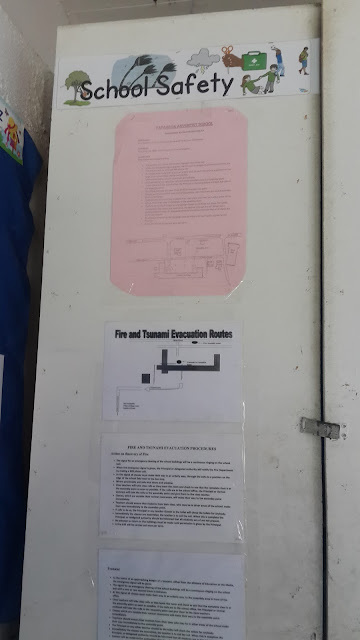 Now, for the boring exit and evacuation notices - I made a 'School Safety' banner. A really cool feature on the Twinkl site is the 'Twinkl Create' section. You can create any sort of resource you want, and write what you want as well as pick from a variety of images they have on file. 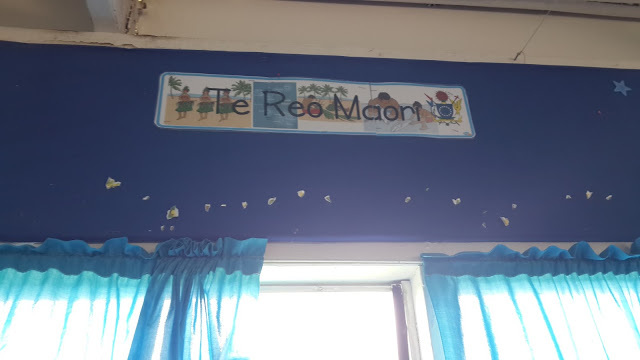 I also made a 'Te Reo Maori' banner as The Cook Islands teach both English and Cook Island Maori. 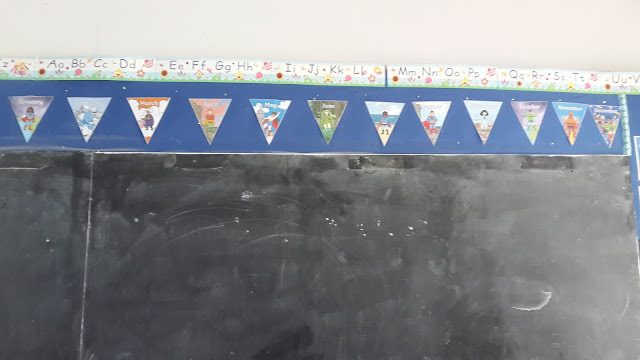 Cool Superhero bunting for the months of the year! The kids loved the superhero theme! Even better, all the Twinkl resources with images of people include people of color. As I am teaching in The Cook Islands, my students are all skin tones - beautiful brown skin would be the most common - so it was awesome to see the superheroes the same skin tone as the students! 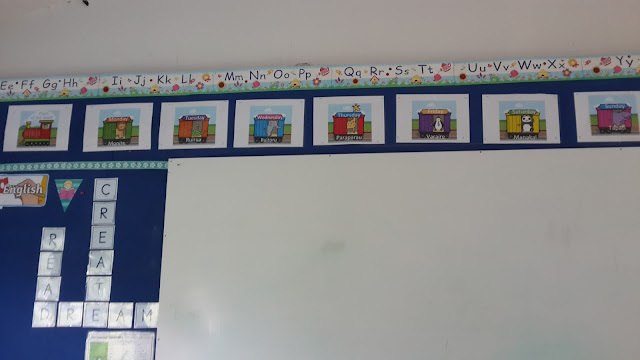 I used the Twinkl animal train for the days of the week - but also edited the resource, as you're able to download it in word.doc - and then I added the Cook Maori translation! 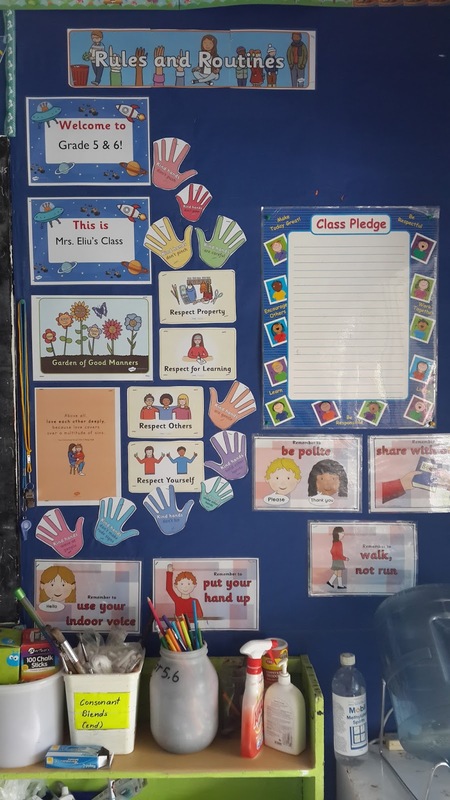 A class rules and routines corner. I really love the space theme welcome signs, "garden of manners" poster and kind hands displays. The class pledge was already in the class, I just had it cleaned and posted, ready for the new year. Overall, the class looked great and the students loved the new decor. Twinkl was a great website to use. Easy to download, print and laminate. I would definitely recommend it for all class decor needs. Plus, all the resources as well! 1. People of colour appear in 90% of their display items - great for multicultural awareness. 2. 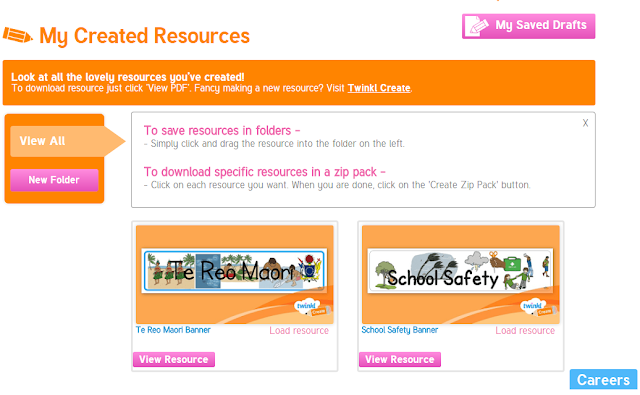 You can create your own resources using their website and easily print it out. -This was especially useful for me as I could make Cook Island Maori resources. 3. You can edit most resources - I was able to download some resources in word.doc format, so I could easily add translations and more!